Hoolock gibbons represent a distinct genus of the gibbons (Hylobatidae) and are widely distributed in Indoburma, including Bangladesh, Myanmar, NE India and SW China. The name Bunopithecus has generally been used for this genus. In a recent publication, however, Mootnick and Groves (2005: Am. J. Primatol. 26: 971-976) show that the name Bunopithecus is not applicable to hoolock gibbons. The type specimen of Bunopithecus is a fossil mandibular fragment from a Mid-Pleistocene fissure deposit in Sichuan province, China. Because its dental characters fall outside the range of modern Hylobatidae, this suggests that Bunopithecus represents an extinct genus of the Hylobatidae. As a result, the name is not applicable to modern hoolock gibbons, and the genus of the hoolock gibbons has to be renamed. This is exactly what Mootnick and Groves do in their recent publication (2005). The authors retrace the history of the name Bunopithecus. They document how the name came to be applied to hoolock gibbons (through the misinterpretation of two correctly published figures), and they explain why the Bunopithecus type specimen is not a hoolock gibbon. Finally, they supply a new generic name - Hoolock - for hoolock gibbons and provide a new description of the genus. The scientific name of the species thus changes to Hoolock hoolock. 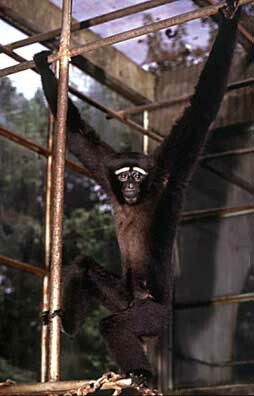 Although hoolock gibbons (Fig. 1) are widely distributed in Indoburma, much of their habitat in Bangladesh, NE India (Assam) and SW China (southwestern Yunnan province) is extremely fragmented (Alfred & Sati, 1990; Choudhury, 1996; Lan, 1994). This makes hoolocks particularly vulnerable to hunting and predation. Most populations are very small and declining (Choudhury, 1996; Mukherjee et al., 1992), and many local populations will probably go extinct in the near future (Alfred & Sati, 1990). The largest hoolock populations are believed to exist in Burma (Myanmar), but not much information is available on their status. Some information suggests that hoolocks have disappeared from some forested areas in Burma, but a substantial number of sightings have been reported along the lower Salween River, a region of intensive logging (Anonymous, 1990; Eudey, 1990; Marshall, 1990). Fig. 1. Subadult male (left) and adult female (right) of the hoolock (Hoolock hoolock). Fotos: Thomas Geissmann. It is widely known that gibbons can be split into four systematic groups that appear to be of roughly similar phylogenetic age. During several years, these four groups have usually been recognised as subgenera (i.e. Bunopithecus, Hylobates, Nomascus, and Symphalangus, respectively) (e.g. Geissmann, 1995; Marshall & Sugardjito, 1986; Prouty et al., 1983). The scientific name used for the hoolock gibbon was, therefore, Hylobates (Bunopithecus) hoolock. More recently, it has been reported that the molecular distances among the four gibbon subgenera are in the same range as those between humans (Homo) and chimpanzees (Pan), or even higher, and that all four gibbon subgenera should be raised to genus rank (Roos & Geissmann, 2001). Therefore, the scientific name for hoolock gibbons should be Bunopithecus hoolock. Recognition of the four groups as full genera is now widespread (Brandon-Jones et al., 2004; Geissmann, 2002; Takacs et al., 2005). 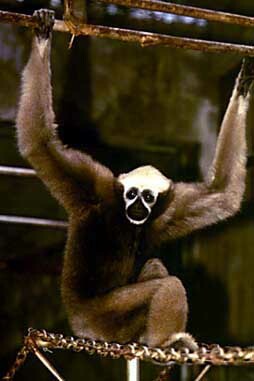 As pointed out by Groves (2001, 2002), however, using the name Bunopithecus for hoolock gibbons is problematic. The type specimen of Bunopithecus is a fossil mandibular fragment from a Mid-Pleistocene fissure deposit in Sichuan province, China. Groves was able to show that dental characters of this specimen fall outside the range of modern Hylobatidae. This suggests that Bunopithecus represents an extinct genus of the Hylobatidae, and that the name is not applicable to hoolock gibbons. Obviously, the genus of the hoolock gibbons had to be renamed. This is exactly what Mootnick and Groves did in a recent publication (Mootnick & Groves, 2005). The authors retrace the history of the name Bunopithecus. They document how the name came to be applied to hoolock gibbons (through the later misinterpretation of Colbert and Hoojer's (1953) two correctly published figures), and they explain why the Bunopithecus type specimen is not a hoolock gibbon. Finally, they supply a new generic name - Hoolock - for hoolock gibbons and provide a new description of the genus. The scientific name of the speciest thus changes to Hoolock hoolock. Alfred, J.R.B. & Sati, J.P. (1990). Survey and census of the hoolock gibbon in West Garo Hills, northeast India. Primates 31: 299-306. Anonymous (1990). Primates die as Burmese forests destroyed. IPPL (International Primate Protection League) Newsletter 17(1, April 1990): 12-13. Brandon-Jones, D.; Eudey, A. A.; Geissmann, T.; Groves, C. P.; Melnick, D. J.; Morales, J. C.; Shekelle, M. & Stewart, C.-B. (2004). Asian primate classification. International Journal of Primatology 25: 97-164. Choudhury, A. (1996). Primates in Bherjan, Borajan and Podumoni Reserved Forests of Assam, India. Asian Primates 5(3-4): 10-11. Eudey, A.A. (1990). A note on the hoolock gibbon. IPPL (International Primate Protection League) Newsletter 17(1): 13. Geissmann, T. (2002). Taxonomy and evolution of gibbons. In: Soligo, C.; Anzenberger, G. & Martin, R.D. (eds. ), Anthropology and primatology into the third millennium: The Centenary Congress of the Zürich Anthropological Institute (Evolutionary Anthropology Vol. 11, Supplement 1) (pp. 28-31). New York: Wiley-Liss. Groves, C. P. (2002). Where nomenclature is a stumbling block: The Bunopithecus problem. In: Caring for primates. Abstracts of the XIXth congress of the International Primatological Society, 4th-9th August, 2002, Beijing, China (pp. 121). Beijing: Mammalogical Society of China. Lan, D. (1994). Progress of surveys of hoolock gibbon in Yunnan: Distribution, population size, habitat and conservation. Chinese Primate Research and Conservation News 3(1): 8-10. Marshall, J.T. (1990). Salween River gibbon study area: Thailand and Burma. Natural History Bulletin of the Siam Society 28: 93-94. Marshall, J. T. & Sugardjito, J. (1986). Gibbon systematics. In: Swindler, D. R. & Erwin, J. (eds. ), Comparative primate biology, vol. 1: Systematics, evolution, and anatomy (pp. 137-185). New York: Alan R. Liss. Mootnick, A. & Groves, C. P. (2005). A new generic name for the hoolock gibbon (Hylobatidae). International Journal of Primatology 26: 971-976. Mukherjee, R.P., Chaudhuri, S. & Murmu, A. (1992). Status and conservation problems of hoolock gibbon (Hylobates hoolock) in some of its range of distribution in north-eastern India. Primate Report 34: 133-138. Prouty, L. A.; Buchanan, P. D.; Pollitzer, W. S. & Mootnick, A. R. (1983). Bunopithecus: A genus-level taxon for the hoolock gibbon (Hylobates hoolock). American Journal of Primatology 5: 83-87. Roos, C. & Geissmann, T. (2001). Molecular phylogeny of the major hylobatid divisions. Molecular Phylogenetics and Evolution 19: 486-494. Takacs, Z.; Morales, J. C.; Geissmann, T. & Melnick, D. J. (2005). A complete species-level phylogeny of the Hylobatidae based on mitochondrial ND3-ND4 gene sequences. Molecular Phylogenetics and Evolution 36: 456-467.